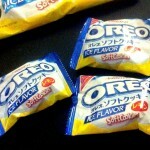 Review: Oreo Soft Cookies Ice Flavor Lemon | Oyatsu Break! I was on an insane quest for Pumpkin Cheesecake-flavoured Kit Kats, which were released in early October 2011 in Japan, in celebration of Halloween. Last year I had missed out on the Halloween Caramel Pudding Kit Kats, and I was determined not to let that happen again. The quest had me take a random exit on the west side of Ikebukuro station to see if the convenience stores on the ‘wrong’ side of town would perhaps be less frequented by candy aficionados. To my great fortune, there was a candy store just steps away from the exit I took… but to my misfortune it was almost entirely Kit Kat free (ugh… regular), and I ended up with Oreo Lemon Ice cookies instead. I’ve never had a ‘soft Oreo’, which is to say Oreo cookies with soft chocolate cookies instead of the firm biscuits and an even creamier cream center, as I consider them sacrelicious. 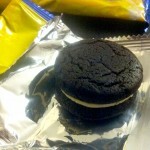 Sure, they’re probably tasty, but Oreos are an experience, not merely a snack, tied as they are to my childhood. Yes I realize this idea runs deeply counter to a blog that exists to explore all of the delightful ways notions of candy and snacks have been transformed (perverted?) by the Japanese, but I am vast, and contain multitudes. 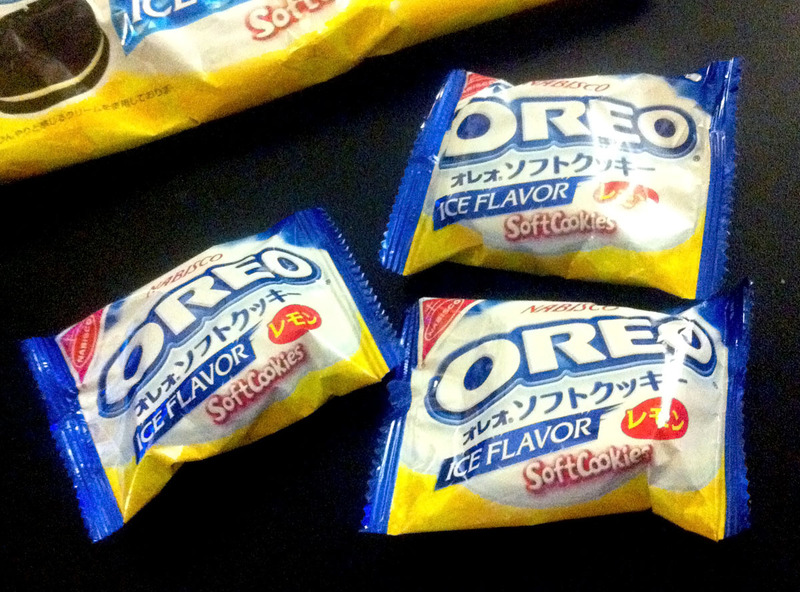 Still, despite my disappointment at a lack of new Kit Kats in my slightly-scuzzy candy store, I didn’t hesitate to pick up Lemon Ice Oreo Cookies because, and I think this bears repeating, OREO SOFT COOKIE ICE FLAVOR LEMON. It sounds amazing! Let’s see if it lives up to the hype. Packaging: Comprised of a very large bag holding only 8 individually wrapped cookies. My first thought is that this is a new level of wasteful packaging, but when in Rome… The packaging is a subtle twist on traditional Oreo packaging. 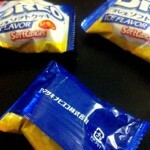 That deep Oreo Blue gives way to a splash of white and lemon yellow, and while there is a ton of superfluous lettering/advertising on the package (the word NABISCO is written twice, at roughly the same size, 5cm apart, for no discernible reason) it’s all well-placed and the bag doesn’t feel too busy or cluttered, but it could still be paired down quite a bit. Scent: Whoa! It’s LEMONY. And in like an intense, chemical lemon way rather than merely snorting a bunch of freshly-squeezed lemon juice. It’s definitely a scent that hits you as soon as you crack the package. The cookies do have a pleasing chocolately scent, but it’s mostly drowned out by LEMON. Taste: The smell of the lemon is maybe so intense because, as soon as you taste the cream filling, you get the ‘ice’ part of the taste equation… It’s not peppermint or anything close, it’s like a menthol cool flavour mixed with a candied sweet lemon, and tasting it I realized that part of the ‘chemical’ smell of the lemon was actually just whatever was ‘icy’ in this cookie affecting my sense of smell. It’s weird. 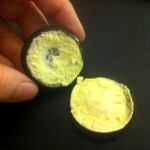 A bite of the whole cookie is actually a little tough to accomplish, because biting the two halves of the cookie together pushes the cream filling out the sides, giving you a bit of an unbalanced bite, mostly soft cookie. 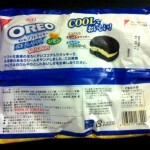 It’s okay—it’s an approximation of an Oreo cookie, but milder in flavour. There’s something a bit… doughy about it, it really has an unappealing texture. When you do get a mouthful with the right cookie to cream proportions, the lemon ice is just totally overwhelming. Even now, while I’ve got little bits of soft cookie stuck in my teeth, the menthol lemon flavour is making my mouth and throat tingle like I just had a whole bunch of those “Icy Drops” breath cleansers. Verdict: Actually, that is exactly what that taste is—Icy Drops—a taste designed to cleanse your mouth and breath, but as a part of the snack you’re eating. You know what that is? That’s weird. The thing is, somewhere along the way, I feel like someone figured out how weird this would be and dialed everything back quite a bit. It’s kind of strange and off-putting in a couple of different ways—lemon and chocolate is a bit of a difficult balance at the best of times, and those soft-cookies are inferior to standard Oreos in every way. But what could have been an insane burst of flavours in my mouth is instead mild and bland and kind of tingly but not tingly enough. 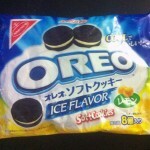 Unfortunately this isn’t even an interesting failure, and while I’m glad I got to try something called OREO SOFT COOKIE ICE FLAVOR LEMON, I really wanted a heck of a lot more.